You’d be surprised at the number of people who don’t know how to prioritize. There have been people I’ve worked with, people who have been entrepreneurs for many years, who are always running around like chickens with their heads cut off. I’m definitely guilty of this, too. I often catch myself at the end of the day thinking, “Wow, what was I really doing today?” It’s so important to try to lock in and focus on the things that actually matter in order to move your business forward. I’m going to share a tool that’s going to be your secret weapon for prioritization. It’s called the “The Eisenhower Matrix.” People also called it “Eisenhower Box.” It’s helped me tremendously by teaching me to focus on the truly essential things I have to accomplish every day. The Matrix is divided into four quadrants. Each section is a variation of two qualities: urgency and importance. In the top left quadrant, you have the “Urgent and Important” category. These are the things you need to do right now, the things on your immediate to-do list. Let’s say your chief operating officer quit or you need to fill in for somebody who’s out on leave. These are the phone calls that are coming in on deals that you need to close. These are the things that require your immediate attention. 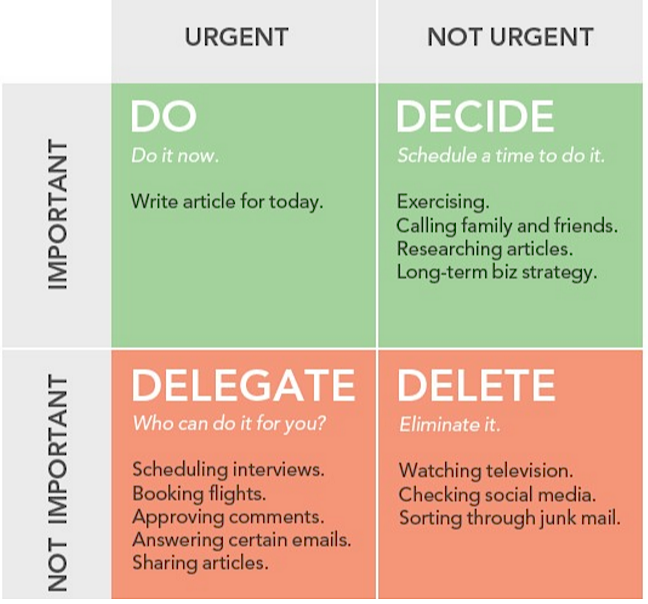 In the top right, you have the “Not Urgent, But Important” quadrant. These are things like going to the gym and taking care of your health. I have writing my book marked in this quadrant. It’s important to me, but not urgent because I haven’t set a specific deadline yet. In terms of your business, this quadrant might include strategizing for next quarter or next year’s business strategies and tactics. These are the things that you need to do and know are important but you don’t often set the time for. The bottom left corner is for the “Urgent, But Not Important” tasks. These are tasks that you delegate, like scheduling flights, booking interviews, or responding to social media. Delegating allows you to focus on the things that you are actually good at, that you can do the best. Finally, in the bottom right, you have the “Not Urgent, Not Important” category. This one is pretty self-explanatory. These are the things you shouldn’t even bother doing. I’ve put “watching TV” and “sorting through junk email” in this box. I just ignore email because I get so many people trying to spam me, get me on webinars, or get me to buy stuff. It’s just not worth it to spend my limited time and energy dealing with that. Another thing I put in my box is “checking social media all the time.” Something I tend to do is browse Twitter and save a bunch of articles to read in the future. It feels like I’m progressing in some way—but I’m not actually reading most of that stuff. It’s just a way for me to kill time. These are the things that are going to truly move you forward long term. They’re also the things you’re most likely putting off. Like I mentioned, I put writing my book in this box. I know if the book does well, it will open up a lot more doors and give me more advantages. So I know this is something I need to prioritize. This quadrant is actually what you need to set aside time to accomplish. I find that if I can get even one thing from this quadrant done every day, I’m good to go. 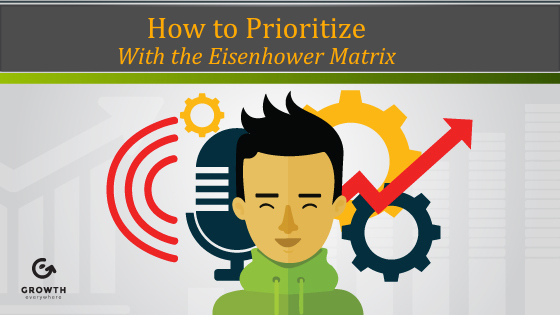 This Eisenhower Matrix has really worked for me so I hope this tool will be helpful for you to prioritize your life and ultimately be the most productive you can be.